I took a day off to recover from my second Thanksgiving. This was supposed to be just a small dinner at the Mysterious Chinese Woman’s Mysterious Mother’s house, but such was not the case. Turkey, a ham cooked by Jim, the instigator, corn pudding and two homemade pies (apple and pumpkin) courtesy of the Mysterious Chinese Woman, chicken and duck courtesy of the Not-Too-Mysterious Sister-in-Law, and veggies, shrimp, noodles, and soup prepared by Mysterious Mother, and an ice-cream cake courtesy of Carvel. Did you know that Carvel no longer makes cakes in any shape other than round. I think even the whale has been retired. How sad. Mr. Carvel is probably turning over in his grave. Well, not a very big sake bar, that is for sure. Just a bit of a hole-in-the wall on 7th Street between Avenues B and C. It is pleasant enough though, with a small L shaped bar that accommodates four wooden chairs on each side. The top of the bar is two shades of dark wood inlays and the front is reddish wood panels. There is a wooden footrest that looks like it might be oak. A variety of red beaded lights hang over the bar. Behind the bar is a refrigerator with a glass door filled with wine and a kitchen cabinet with a coffee machine, an espresso machine, and a cash register sitting on top. On top of the refrigerator are several bottles of sake and a stereo with two silver Hello Kitties sitting on top. I just love those little things. They are so cute. The side of the refrigerator had a bunch of Batman themed pictures including one of Alfred E. Neuman in a Batman costume and some guy and his little boy similarly attired. A small shelf above the kitchen cabinet holds a couple of small teapots and tins of tea and small cups hang from hooks on the front. A wooden rack of glasses is suspended above the bar by chains entwined by colorful flowers, artificial, but pretty. A black metal wine rack with unopened bottles of wine in it and open bottles of wine in front of it sits on one end of the bar. The wall opposite one side of the bar has a bench covered with orange cushions with Asian designs. 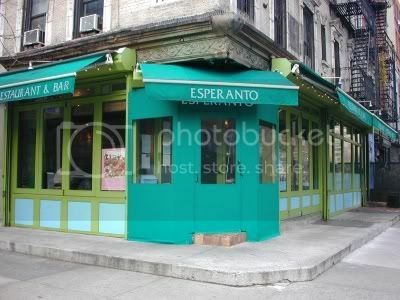 Four tables with multi-colored tops sit in front of the bench and down one step, but still a step up from the floor, are half a dozen ice-cream parlor type stools with round seats in bright colors atop metal poles. Four bright red fringed lights hang over the tables. 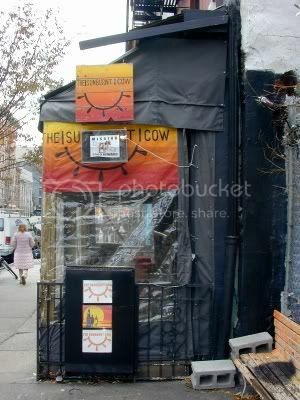 There are lots of wallet sized photos of regulars on the walls as well as several abstract painting that were done by the same artist, someone living in the neighborhood, I presume. Four smaller greenish and tan and black squiggly paintings hang on the wall next to the wine rack on the bar. The floor is small white mosaic tiles; the walls are cream-colored as is the wall except for the section over the bar that is black. I had a bottle of Sapporo. A lot of bars on this stretch of Avenue C weren’t open yet and I had to peer in here at 137 Avenue C to make sure this one was. It was and it made me glad. The somewhat small L shaped bar has a top of alternating black and white acrylic squares and the white ones are lit from beneath, but just barely. The front looks like it might be made from black 50 gallon drums. There is a wooden foot rest. 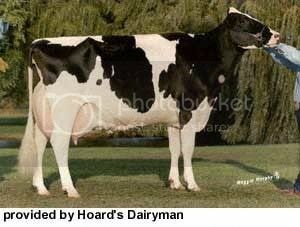 The bar stools have square seats covered in fabric, red and black and white and black, patterned like a Holstein cow. Maybe that was what the black and white bar top was supposed to represent too. Two beer stations each have three spigots. Behind the bar are a couple of stainless steel coolers and a large chest filled with beer and ice. Above those are tiered shelves of liquor. The wall behind appears to be a tropical beach being enjoyed by a herd of cows that, I presume, are getting sunburnt. Continuously projected upon that lovely scene is a loop of film clips ranging from surfers to martial arts to extreme bicycling. Kind of mesmerizing, especially with the Stones (one of Bar Man’s favorite groups) playing in the background. The wall opposite the bar is rough plaster in two shades of orange and there are a few stools in the front next to the windows. The ceiling is a deep sky blue patterned tin and the floor is old wood. One small stretch of wall by the door is brick and has a steer skull mounted on it and some small illuminated Moo Juice signs. There is a skylight over a dining area towards the back and all the way in the back is another dining area with windows looking out on a pleasant garden-like landscape. A neat little place that, once you are inside, does seem as though you could be in Mexico or Cuba or Puerto Rico or someplace similar. Just a small, wooden topped bar with a wood slat front and no place for your feet. From the clutter on the bar it doesn’t look like they encourage a drinking crowd. The only other two people were having a bite to eat. This is probably more of a holding area for the decent-sized and well populated dining area. The bar stools are old wooden things and uncomfortable enough so you probably wouldn’t want to linger. Behind the bar are old wooden cabinets with liquor sitting on top and two sets of glass shelves mounted on the rose colored wall and they held bottles of liquor. There was also an old white wood and glass paneled cabinet sitting on top of one of the cabinets. 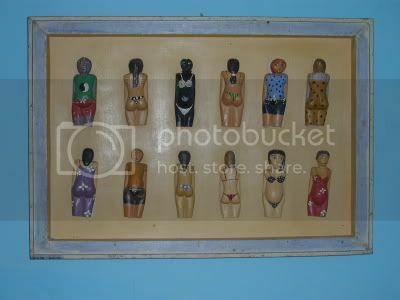 Also mounted on the wall is a bunch of wooden butterflies mounted on a blue wood panel and, I think, the Virgin Mary in a small glass case. Not the real Virgin Mary, just a small statue. To the right of the bar is a green plaster and yellow corrugated tin wall with a window in it that makes it seem as though you are sitting next to a small house. Drink specials are written on the yellow part of the wall in red and the $3 chips and salsa special is written in blue. Overhead lights are shaded in swollen tube shaped woven wooden strips. The floor is a combination of old looking Mexican tiles and old wood. There are windows on two sides (the bar is on the corner of Avenue C and 9th Street) that face parks, but they are typical lower East Side parks so they are a bit gritty. 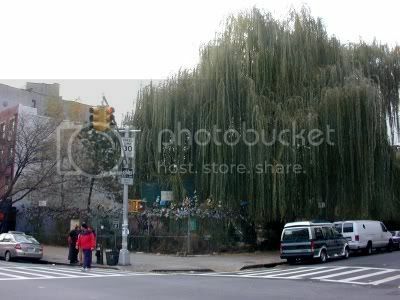 One of them, the one with the large weeping willow, is the park next to Sunburnt Cow. There is lots of lime green and wood in here and the crowd of customers seemed to be enjoying themselves and the food. A little piece of artwork showing people sunbathing made me eager for my return to Mexico in a few months. Another place to return to and sample the food and, at $6 each, the mojitos and caipirinhas as well. There was also a nice sounding two-piece group playing Latin melodies and singing in Spanish. I had a glass of red wine and the bartender gave me an extra splash as I was leaving. A nice gesture. A pleasant enough day with three bars hit making 960 for the year and leaving 40 to go. A Jets game tomorrow, whoopie. Two of the worst teams in the NFL playing at 8:30 P.M. so the game can be on National Television. Boy, I bet that draws a big audience. Of course my buddy Bernie will be here at 2:00 P.M. so we will have ample time to tailgate. With a little luck I will pass out right after the kick-off and not wake up until the two-minute warning. His hot apple cider and Wild Turkey will help with that. Bar Number 1000 is creeping up and it is going to be PIONEER in New York and I will be having my drink there on Friday, December 30th. Stop in, have a drink with me, be a part of history, and start your New Years Eve celebration a day early. 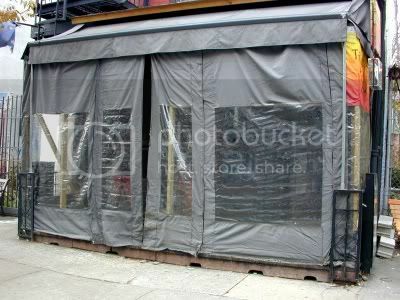 PIONEER is located at 218 Bowery, and what could be more New York than that. It is easy to get to by subway, which would just add to the experience. You can find out more about PIONEER by clicking the picture below. I expect the partying will start in the early evening but I will post the specific time well in advance. By the way, post a comment if you know what the number 7919 has to do with me hitting bar number 1000. It was such a miserable day yesterday, rain and win, that I just holed up and caught up on the Sunday paper. 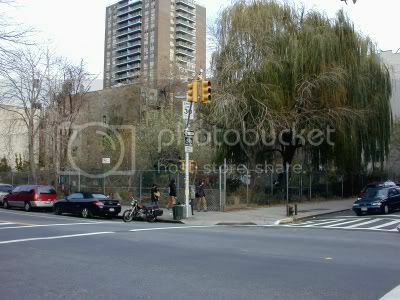 It was a lot nicer today though, cold but sunny, so I headed back to the Lower East Side. Hey, I finally made it to the mother of all dive bars. 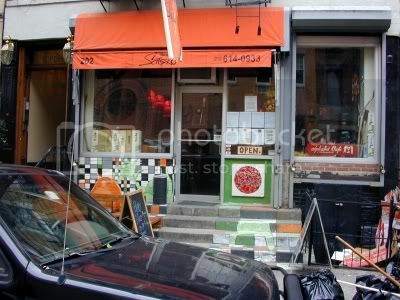 The inside of this place on 1st Street and 2nd Avenue looks just like the outside, and that is saying something. This truly is one of the last holdovers from the bad old days down here when you took your life into your hands every time you walked down the street. But this place is so bad it is good. 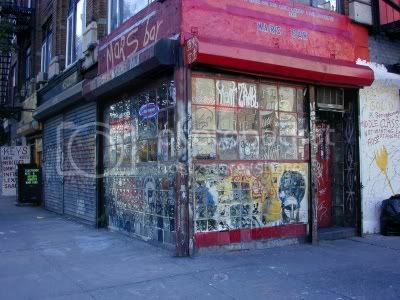 It is in the same category as CBGB, a place you got to see while it is still here to be seen. I stopped by in the early afternoon so it wasn’t as bad as I expected, but then maybe I am getting a bit jaded. I guess you have to be here late at night to fully appreciate the ambience. The bar has a black vinyl top with a wood arm rest completely covered with carved initials and crude attempts at lewd art. The front is covered with graffiti reminiscent of the old days when “subway art” was so popular. There is a well worn wooden footrest and bar chairs and stools of various shapes and sizes, all suitably banged up and, if there was any kind of vinyl seat, well torn. A set of old black cabinets behind the bar have a few bottles of liquor on top and much more in an open shelf below. The white plasterboard wall is covered by an assortment of “art” by locals and any open area has the remnants of scrawlings that have been inadequately whitewashed over. The tan ceiling has a single overhead fan and it to is covered in an assortment of black drawings and what have you. The back wall and the wall opposite the bar are a bit more colorful but only because the graffiti artists had a more colorful palette. Pretty much every square inch is covered with graffiti including the bathroom that I could catch whiffs of from half a bar away. There were lots of cases of empty beer bottles stacked against two walls, a Roller Coaster pinball machine upfront by the windows, which are a combination of glass blocks and small window panes, a colorful jukebox and a Megatouch 5000 video game in the back. There was a candy machine and a couple of peanut machines, but I think I can pass on those. Come in and check the place out. My feeling is that there is a reason that the artists whose paintings hang on the walls hang out in a place like this. I had a bottle of Budweiser. I don’t know why I like this place, but indeed I do. Maybe it was the two guys in the corner having an animated, but friendly, conversation in French. Maybe it was the bar with the hammered copper top and foot rest and black metal front with a stamped patterned black front that was chipped to reveal yellow paint underneath (or was yellow chipped to reveal black). Maybe it was the low sun streaming through the glass paneled doors and windows in front. 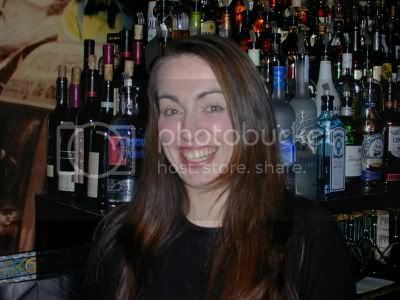 Maybe it was my Pernod on the rocks. Oh well, what difference does it really make. It is only about half a block from the Mars Bar, on 1st Street between 1st and 2nd Avenues. You can’t miss it though because it is bright yellow. This is just a small place that advertises itself as a Thai bistro. The bar, although small, was quite pleasant. At the end of the bar close to the front are three milk white lights hanging over the bar that look a bit like reservoir tipped condoms (small tips though). Over the center of the bar is one of those water-sprinkler fixtures with a couple dozen small red bulbs. In the back are two old schoolroom looking milk-glass lights fixtures. The bar back is mostly glass shelves, half backed by the same stamped metal that fronts the bar, and the other half backed by mirrors. The shelves are full of liquor bottles, wine bottles, beer bottles, and a single light tan ceramic Mr. Peanut statue. A couple of bunches of green banana complete with the large, somewhat phallic, flower hanging from the bottom. Lots of red and orange topped tables line the walls that are bright blue and covered with mirrors up front and more of a pea-soup green in back. The tables have old wooden chairs on one side and benches with leopard-skin and green cloth backs above red seats on the side by the walls. A couple of elaborate mosaic round tables with chairs are in the center of the room. The ceiling is light stamped metal and the floor is dark. Three fans hang from the ceiling. An interesting enough place and I may very well stop by for dinner one evening, or perhaps just lunch. I had a Pernod on the rocks and caught the subway home. A decent enought day, just two bars hit but that makes 957 for the year and only leave 43 more to go. I will be taking tomorrow off to celebrate Thanksgiving so have a good one your self. 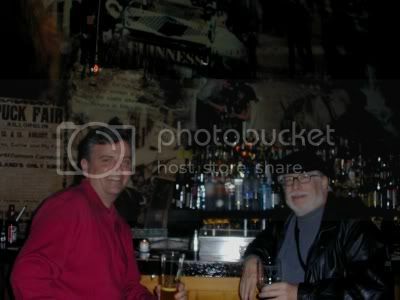 One of the readers of my blog, Mark from Saratoga, came to town and had sent me an email suggesting we get together for a drink or two. He had a couple of places in mind and they were pretty good picks. 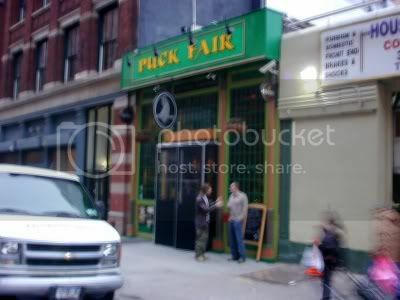 This Puck Fair is a bar located at 298 Lafayette. Its name comes from the Puck Fair that is held every year in Killorglin, Ireland, and is Ireland’s oldest fair. Now, boys and girls, here is the educational part of my posting. 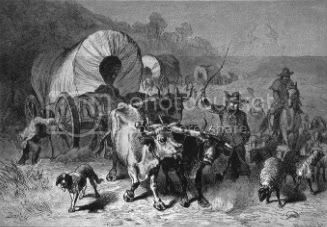 Each year in Killorglin, Co. Kerry (in the month of Lunasa) August 10th, a Puck Fair is held. The Puck, a wild mountain goat, with decorated horns, is paraded through the streets with rapturous applause and cheering. On arrival at the town square he is crowned and then ceremoniously raised on a scaffold platform some twenty five feet high. The Puck resides here for the next three days and nights looking down on his subjects. The well-known song An Poc ar buile, 'The Mad Puck Goat', is associated with the festival which dates from the seventeenth century. At that time, a herd of goats was grazing on a high peak, when the noisy throng of Cromwell’s army shattered their peace. Alarmed and frightened, the goats scattered and ran into the hills - all of them that is except for one brave, or confused, male who ran down the mountain and into Killorglin. The local people on seeing the goat sensed something was wrong and took cover. The people of Killorglin survived and have commemorated the event by holding the fair ever since. Okay, back to the basics. Puck Fair is owned by the same people that own Swifts and Ulysses. 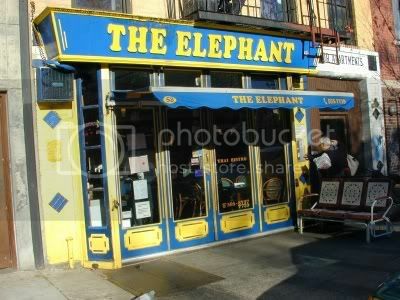 In fact they run a free shuttle bus between the three bars. Swift and Puck Fair are actually within walking distance of each other but Ulysses is down in the Wall Street area. Coincidently, Puck Fair is located across the street from the Puck building. 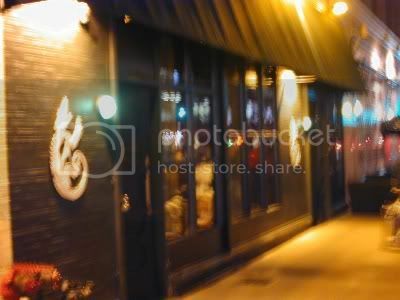 It is a large place, has wooden partitions against the brick wall opposite the bar help break up the space and make somewhat cozy. The bar long wooden bar has a black painted top chipped in enough places to almost make it look intentional because the chipped places reveal the wood below. There is a foot rest and plain wood bar stools. The beer spigots, about twenty of them are curved silver pipe-like affairs, kind of interesting. I don’t think I have ever seen quite so many of these in a row before. There were little candles on the bar giving it an intimate look. The wall behind the bar features a large mural that appears to be a collage of scenes from Ireland, perhaps scenes of the Puck Fair. Hanging over the bar are small clear bulbs with the filaments glowing orange hanging from the beamed ceiling. In the middle of the ceiling is a somewhat grim coated skylight. There are black cabinets with glass doors behind the bar with glasses sitting on top and tiered shelves above them holding the liquor bottles. Towards the back are larger wooden cabinets. The windows in the front have small wooden panes. There is a large basement area usually reserved for parties and a mezzanine in the back with more seating. There is also another bar in the back which seem like a good idea because when the place gets packed the one in the front would be hard pressed to serve the crowd. I always like an Irish bar that features a drink called the Car Bomb. There are numerous recipes for this drink but the one I like is just drop a shot glass full of Irish whiskey into a pint of Guinness and chug it. Chipped teeth may result. I had a Guinness, minus the shot. Just up Lafayette a bit is this bar that has no sign out front and might be easy to pass by because the front is quite dark and no light emits from the windows. Two white stylized lizards distinguish this from just another building. Do not, however, pass it by. Walking into the bar is like going inside a milk chocolate candy (that description is courtesy of the Mysterious Chinese Woman). Dim lights emit a soft glow on the rich mahogany walls and large wooden pillar. In the midst of all that brown are colorful bar stools stretched like a row of round red, blue, and cream colored candy drops (that was also courtesy of the Mysterious Chinese Woman who, I suspect, was getting hungry). The stools are the type popular in roadside diners, the seats sit on top of four chrome legs. The room itself is furnished in an elegant 1920s art deco style. The bar is made of highly glossed wood with green marble inserts. It is very long and L shaped, starting from the front entrance and wrapping around the room twards the doorway to the side dining area. Mirrors and glass shelves of liquor line the wooden wall behind the bar. The bottles are lit from behind giving them an colorfully artistic look. Above the far end of the bar are two rows of round lights. The high ceiling is painted black and the grey tile floor is covered with red oriental rug runners. Because it was such a fancy place I had a Lemon Drop (Vodka, Limoncella, lemon juice in a martini glass rimmed in sugar and garnished with a lemon twist). 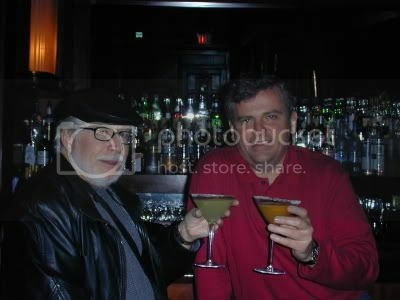 Mark had a Side Car, also served in a sugar rimmed martini glass. The Mysterious Chinese Woman sipped a glass of champagne, and I did take the poor hungry thing to dinner at Armando’s in Brooklyn. Bar Man And Mark Enjoying Our Fancy Drinks. It was a very pleasant evening. I hit two new bars with a new friend and then took him to a nearby bar that I had visited before but kind of liked, Milanos. The same old guy that I mentioned in my write-up of Milanos was still sitting in the same place, but he wasn't talking to himself tonight. Maybe he is a not so silent partner and was just metally calculating his cut the last time. Well I have now hit 955 bars for the year and have only 45 more to go. I will probably be taking some time off towards the end of the week. Thanksgiving and a late Jets game on Sunday will probably take their toll. I still hope to hit another ten before the end of the month though. 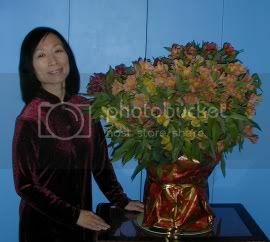 A reader of my blog, Peter Hernandez, sent me a dollar and a request for one of my autographed notecards and sent The Mysterious Chinese Woman a huge bouquet of flowers. I thought that was most generous of him. He is the General Manager of Green Flowers in Miami Florida and if you would like to send him an email telling him what a swell guy he is you can just click the flowers.